Islay has been cradle to many things, early Christianity for one. But it is in malt whisky distilling that this fertile island, some twenty miles by twenty-five, has found its modern vocation. Here, in the still mainly Gaelic speaking community around Port Ellen, on the island's south eastern shores, twelve men today craft pungent, dark Lagavulin™, made on this historic site at least since 1816. The sea has shaped everything here. A narrow fringe of mica schist and hornblende provides coastal relief from the Dalradian quartzite of the hills above, providing Lagavulin with its romantic bay and the offshore island of Texa. Above all, Islay means peat. Miles and miles of peat bog in the west of the island provide the raw material whose influence so characterises the south eastern Islay malts, of which Lagavulin™ is perhaps best known. Lagavulin’s™ richly peaty process water runs down the brown burn to the distillery from the Solan Lochs in the hills above the distillery. Though it shares a coastline with two neighbouring distilleries, former owner Peter Mackie took pains to ensure that Lagavulin shares its water with no-one. Rights over the water course and the surrounding land were hotly contested in his day; his persistence secured Lagavulin's legacy. The barley used to distil Lagavulin™ is malted at nearby Port Ellen and has a strong peat aroma - it has perhaps twenty times as much exposure to peat smoke as a typical Speyside, Cragganmore. Fermentation of the barley is a slow process, too. Between 55 and 75 hours are taken for the full peat-rich flavour of the locally-malted barley to come through. The four stills at Lagavulin, two of them pear-shaped in the style inherited from Malt Mill, take this peaty wort and give it all the time and care it deserves. Following the original practice, Lagavulin™ receives the slowest distillation of any Islay malt - around five hours for the first distillation and more than nine hours for the second is the norm. This long distillation is often said to give Lagavulin™ the characteristic roundness and soft, mellow edges that devotees rightly prize. There's nothing rushed about Islay, nor is there about Lagavulin™; before being bottled, the malt spends sixteen unhurried years breathing the sea-salt air of Islay, mainly in refill European oak casks kept in traditional white-painted warehouses by the sea shore. Long fermentation, long distillation and long maturation together ensure that Lagavulin develops all of its long, rich, peaty character. It’s is a spirit that likes to take its time. The definitive Islay malt demands nothing less. Food suggestion: Delightful with a fine Roquefort cheese and biscuits. Taste style: Complex. Dry and smoky with a big body. Sweetness at first turning to darker smoke (coal) at the close. Perhaps some saltiness too. A much sought-after single malt with the massive peat-smoke that's typical of southern Islay - but also offering a dryness that turns it into a truly interesting dram. 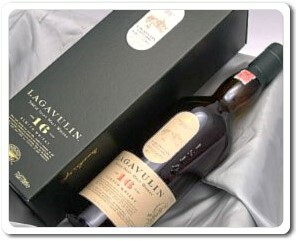 USA Buyers: Click Here for a Full Selection of Lagavulin! 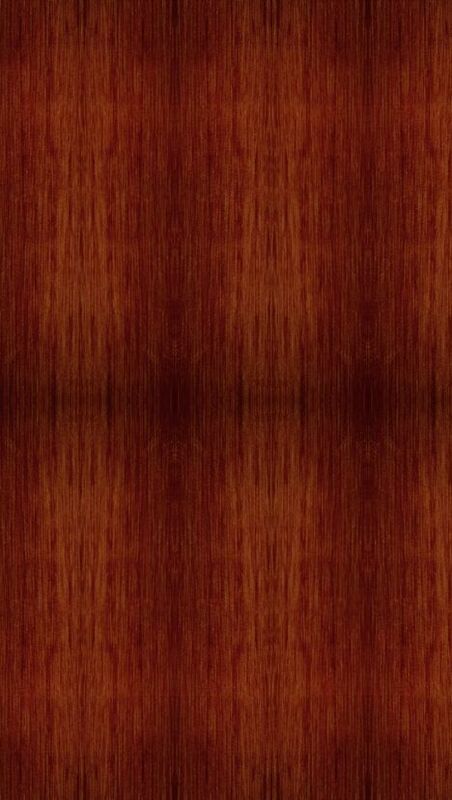 Europe/Asia Buyers: Click Here for a Full Selection of Lagavulin! Among the great homes of malt whisky the greatest is Islay, home even today to seven active malt distilleries. 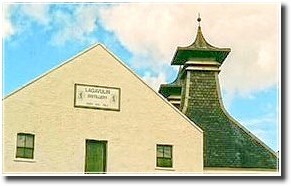 And first among the Islay malts is Lagavulin™ - the definitive Islay malt. Islay came late to law and order. It was well into the 19th Century when arrangements to collect duty here finally fell into line with those applying elsewhere in Scotland and legal distilling became the norm. As early as 1742, there were perhaps ten illicit stills operating at Lagavulin. In 1816 local farmer and distiller John Johnston founded the first legal distillery, within view of Dunyvaig Castle, once the stronghold of the Lords of the Isles. A year later Archibald Campbell founded a second, which seems later to have traded under the name Ardmore. After Johnston's death the two were united, when Glasgow-based Islay malt merchant Alexander Graham, to whom Johnston had been in debt, acquired Lagavulin for the princely sum of £1,103 9 shillings 8 pence; approximately $2000 by today’s currency standard. Graham improved the buildings and his successors, James Logan Mackie & Co., carried on the business successfully. Lagavulin went from strength to strength. Alfred Barnard, visiting in 1887, commented that "There are only a few of the Scotch distillers that turn out spirit for use as single malt whiskies, and that at Lagavulin can claim to be one of the most prominent." Owner Peter Mackie became famous throughout the whisky world as the creator of the famous blend, White Horse. A man driven by the Victorian work ethic and so nicknamed by his staff "Restless Peter", he was continually planning fresh ventures, one of which the famous "traditional" Malt Mill distillery opened alongside Lagavulin in 1908 and closed in 1960. Lagavulin™ is a wonderfully rounded pleasure. Its recently described "awesome and marvellous complexity of flavours" are enjoyed by a small but growing band of malt lovers, for whom this big, dark, intense character just is malt. Open all year round, however, we are closed between Christmas and New Year. Adults: £4.00 / This charge includes a discount voucher which is redeemable in the distillery shop towards the purchase of a 750ml bottle of single malt whisky. Admission is free to all Friends of the Classic Malts. From Port Ellen take the Ardbeg road. Lagavulin is the second distillery on your right. Parking is on the right before you reach the distillery. Expect a great Islay welcome your guide. The offices, reception and dram room are tastefully wood-pannelled with soft green and creams. Look for the huge quilt map of Islay in the reception area. How old is my Lagavulin 16? The bottle I&#039;d number is: L7J 0072053. I have saved my 16 for the past 10 years waiting for a special time to drink it. does that make it better with age? more valuable?